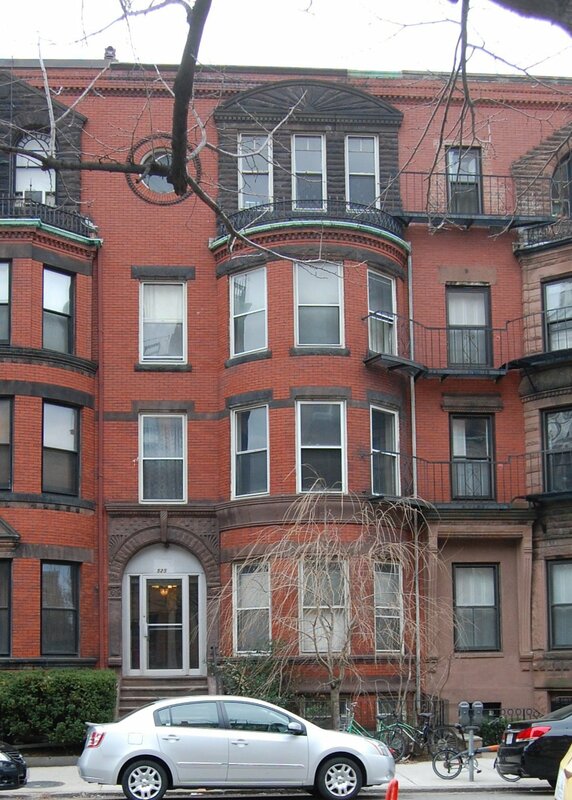 525 Beacon is located on the south side of Beacon, between Massachusetts Avenue and Charlesgate East, with 523 Beacon to the east and 527 Beacon to the west. 527 Beacon is one of ten contiguous houses (511-529 Beacon) designed by architect Samuel D. Kelley and built in 1887 for Chadwick & Stillings (N. Henry Chadwick and Oscar L. Stillings), a hat block and flange company that became a significant house building firm in the 1880s and 1890s. They are shown as the owners and builders on the original permit applications, all dated March 14, 1887. The next year, Chadwick & Stillings built one more house, also designed by Samuel Kelley, at 531 Beacon. 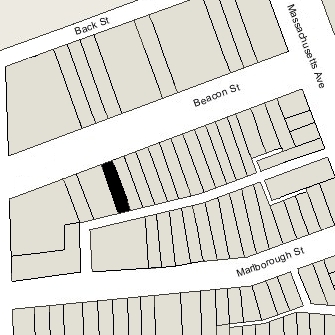 Click here for an index to the deeds for 525 Beacon, and click here for further information on the land west of Massachusetts Avenue between the south side of Beacon and the north side of Commonwealth. On February 8, 1888, 525 Beacon was purchased from N. Henry Chadwick and Oscar Stillings by Samuel S. Shaw, trustee under a marriage settlement indenture between Rev. William Copley Winslow and Harriet Stillman Hayward entered into at the time of their marriage in June of 1867. William Copley Winslow was an Episcopal clergyman and archaeologist. Harriet Winslow died in September of 1915. Under the terms of the marriage settlement indenture, the trustee was to hold and manage Harriet Winslow’s separate property for her benefit and, upon her death, it was to be disposed of as directed under her will. In her will, she left one-fourth of her estate (including one-fourth of the trust property) to her husband and three-fourths in trust for the benefit of her husband and their daughter, Mary. She named her husband and her nephew, Henry Prentice Binney (son of Henry Prentice Binney and Josephine (Hayward) Binney) as trustees. On May 9, 1916, the trustees of the marital settlement trust transferred 525 Beacon to William Winslow and Henry Binney as trustees under Harriet Winslow’s will. William Winslow and Mary Winslow continued to live at 525 Beacon. He married again in May of 1917 to Elizabeth Bruce Roelofson. After their marriage, they lived at 525 Beacon. Elizabeth Winslow died in January of 1923 and William Winslow died in February of 1925. 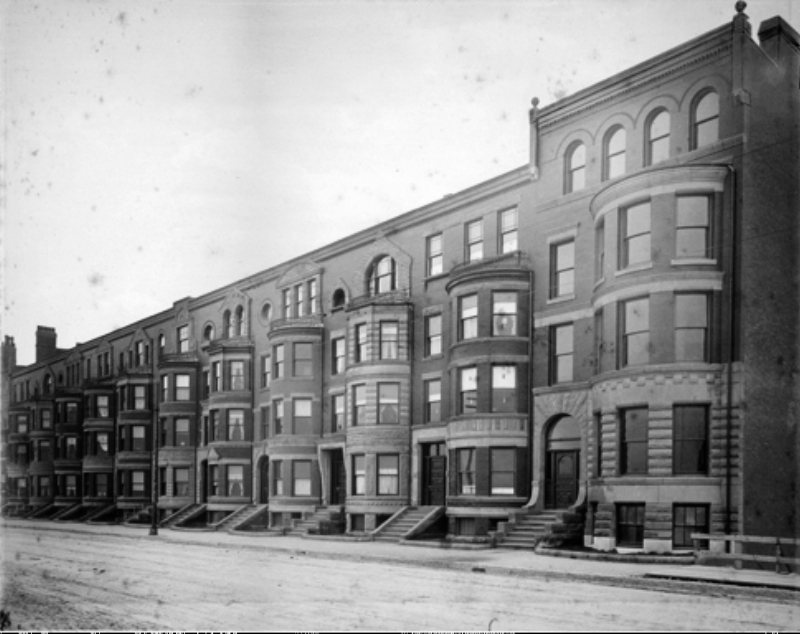 Mary Winslow continued to live at 525 Beacon until her death in 1940. She also maintained a home in Magnolia. On June 24, 1941, 525 Beacon was purchased from the trustees under Harriet Winslow’s will by Hazel Emmons (Berry) Maclary, trustee of the Small Realty Trust. Hazel Maclary was the wife of Richard David Maclary, a real estate dealer; they lived in Wollaston. The next day, she conveyed the property to real estate dealer Wallace Raymond Marden of Hingham, His wife, Marjorie Lewis (Maclary) Marden, was Richard Maclary’s sister. In July of 1941, Hazel Maclary (on behalf of Wallace Marden) applied for (and subsequently received) permission to convert 525 Beacon into a lodging house. 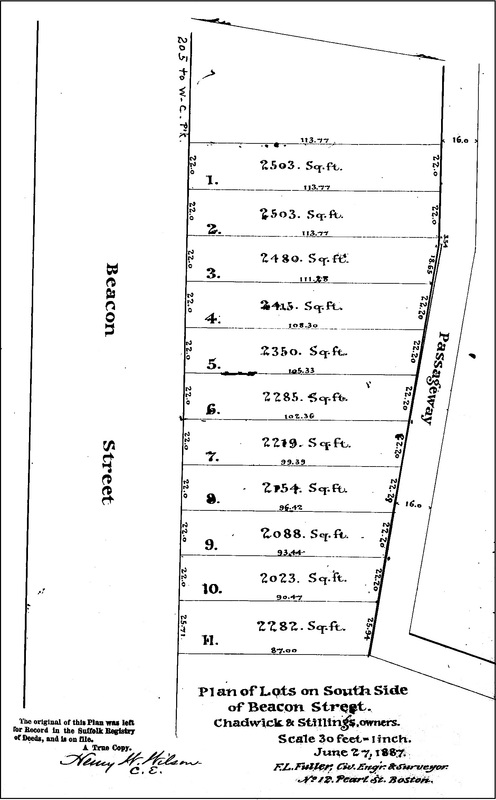 525 Beacon was shown as vacant in the 1942 City Directory. On April 29, 1942, Wallace Marden transferred 525 Beacon to his sister-in-law, Helen Elizabeth (Maclary) Baader, as trustee of the Early Realty Trust. She was the widow of Albert Stanley Baader. By 1943, 525 Beacon was the home of David Henry Little, a printer, and his wife, Esther Viola (Chatfield) Little, who operated it as a lodging house. They previously had lived at 168 Bay State Road. They continued to live at 525 Beacon until 1944. By 1945, 525 Beacon was the home of Lydia R. (Tipping) Adams, the widow of Gordon Adams, who operated it as a lodging house. She continued to live there until about 1947, when she moved to 455 Beacon. On December 30, 1946, 525 Beacon was purchased from Helen Baader by David Lilly, a partner in the Lilly Construction Company with his father, Harry Lilly, and brother, Michael (Max) Lilly. He lived with his parents, Harry and Annie (Nathanson) Lilly, in Dorchester. In March of 1947, he filed for (and subsequently received) permission to convert the property into eight apartments. In December of 1947, he amended his permit to increase the number of apartments to nine. David Lilly married in 1948 to Norma Ravech. After their marriage, they lived briefly in one of the apartments at 525 Beacon, but had moved by 1950. On March 19, 1948, 525 Beacon was acquired from David Lilly by Ellwood B. Allen and his wife, Eva Helterline (Hilton) Allen. They lived in Belmont. Ellwood and Eva Allen were real estate developers and interior decorators. In the late 1940s, they built a recording studio in the basement of their home in Belmont and established the “Radax” record label, which featured local musicians. On October 26, 1949, 525 Beacon was acquired from the Allens by Herbert Augustus Horgan, trustee of the 525 Beacon Trust. He was an attorney. He and his wife, Ada Josephine (Mahoney) Horgan, lived in Brookline. Herbert Horgan died in October of 1957, and his son, Herbert A. Horgan, Jr., succeeded him as trustee of the 525 Beacon Trust. On February 8, 1961, he transferred the property to his mother, Ada (Mahoney) Horgan. On August 15, 1961, 525 Beacon was acquired from Ada Horgan by Aldo Garda and Robert L. Rusconi. On January 3, 1964, 525 Beacon was acquired from Aldo Gardo and Robert Rusconi by John Carpenter Perry of Keene, New Hampshire. On the same day, he transferred the property to himself and his mother, Mabel Harriet (Carpenter) Perry, the widow of James Leland Perry. John C. Perry was custodian of the Historical Society of Cheshire County, New Hampshire, and later would serve as chair of the New Hampshire State Historical Commission. On June 10, 1966, 525 Beacon was acquired from the John Perry and Mabel Perry by John Lecoq, and on July 1, 1968, it was acquired from him by real estate dealer J. Linzee Coolidge. 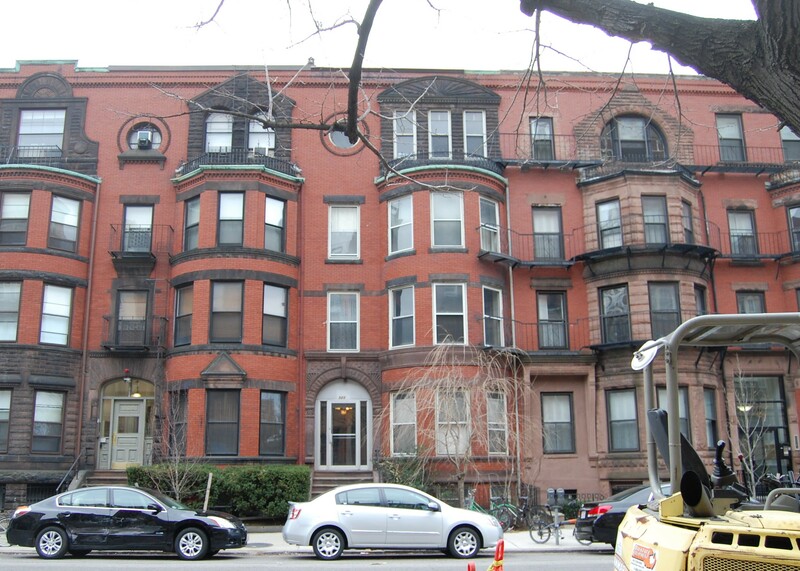 On July 28, 1986, 525 Beacon was purchased from J. Linzee Coolidge by Dale Koppel, trustee of the 525 Beacon Street Realty Trust, and on October 3, 1986, it was purchased from him by Wayne Siegel and John Elia, trustees of the 525 Realty Trust. On June 21, 1995, 525 Beacon was purchased from David Elia, as successor trustee of the 525 Beacon Realty Trust, by Robert C. Yens and his wife, Estah (Leahy) Yens, trustees of a newly created 525 Beacon Realty Trust. Estah Yens died in October of 1995 and Robert Yens died in November of 1997. On September 11, 1998, their son, Christopher R. Yens, successor trustee of the 525 Beacon Realty Trust and executor of Robert C. Yens’s estate, transferred 525 Beacon to Row House Properties, Inc., of which he was the president and treasurer. 525 Beacon remained an apartment house in 2018.